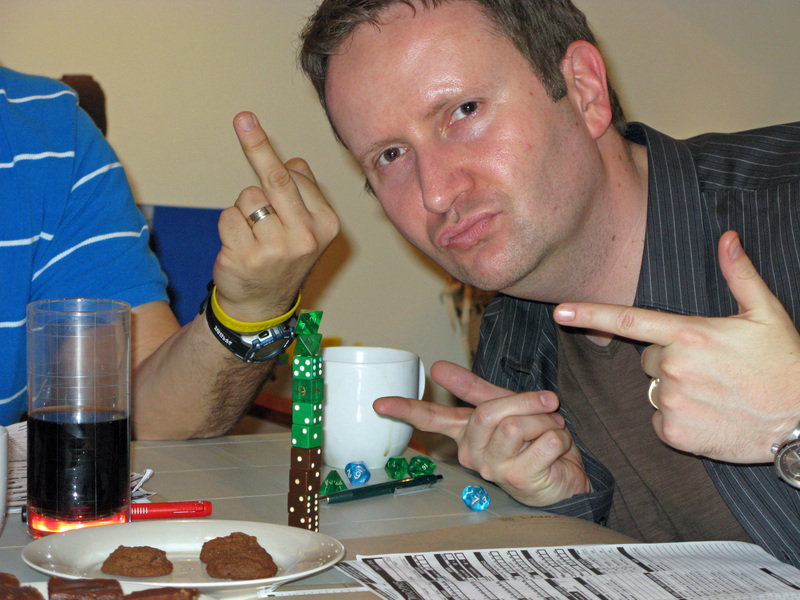 I have a confession to make…I have a bit of a dice and miniature addiction. If you are my wife please stop reading this immediately and know that I love you. It’s not like it’s a cruising bathroom stalls ala Leonardo Dicaprio in “The Basketball Diaries” type addiction. It hasn’t even gotten to the pawing personal possessions stage…yet. However, there is an undeniable craving that occurs usually preceded by a voice softly whispering into my ear. 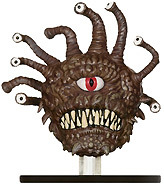 It goes something like this; the voice looking over my notes for my next gaming session says “I see your sicking a beholder on them next time” I respond chuckling “you bet, they’re not going to know what hit them”. The voice then purrs something about how awesome it is going to be and what a great DM I am, then casually says “to bad you don’t have a beholder mini, that would be so cool, but I am pretty sure it will still be awesome without it.” The next thing I know I am online searching thru some store’s inventory or at the game store flipping thru some binder full of miniature cards. The dice, well what can I say it’s all the different colors and styles; I just can’t get enough, no matter how full my dice bag gets. Although, thankfully I haven’t gotten to the point of special ordering dice off the internet yet. This isn’t rational behaviour at all, I am aware of this, as I could never possible use all of the dice I already have, but that voice pops up again telling me things like you never know when you’re going to have to ban a set of dice for consistent bad roles. In all honesty I love playing with minis. I know some people have argued that 4th edition’s reliance on miniatures and dungeon tiles has stolen some imagination and role-playing from the game and made it too tactics orientated. I would put forth that it’s almost a return to the roots of Dungeon and Dragons as the game sprang out of Gygax’s Chainmail miniature game. My gaming group used miniatures for all the D&D, Runequest, and even Champions games we played. Back then they didn’t come pre-painted like today, which made it difficult for people like me with little fine-motor coordination. I have always found that the miniatures helped me with visualizing and immersing myself in the game, plus their just pretty friggin cool to look at. In 4th edition using miniatures, or something representative, is pretty much a necessity given the conditions, movement techniques, and tactics required in the game. That being said, I can’t shake the feeling that the brass at WoTC had meetings where terms like “synergy” were tossed around in order to optimize removing gold pieces from my coin purse without having to make a thievery skill check. This seems most evident and annoying in the one “visible” and four “random” miniature packs on the market these days. Good luck at say trying to assemble enough Kobalds to run the first adventure that WoTC put out in support of the 4th Edition. FYI I had to go to 3 stores and one internet order to do it. This does little to help with my addiction or quiet that voice on my shoulder. I know I should be angry at WoTC and their dealer like methods, but man is it going to be cool when my players face their first dragon and I plunk that huge mini on the table. Oh well I guess the first step in the recovery process is admitting that you have a problem, besides the pre-contemplative stage isn’t so bad is it? So I have been playing in the D&D Encounters at my FLGS. The Encounters program is a 12 part adventure played one encounter each week and sponsored by Wizards of the Coast. 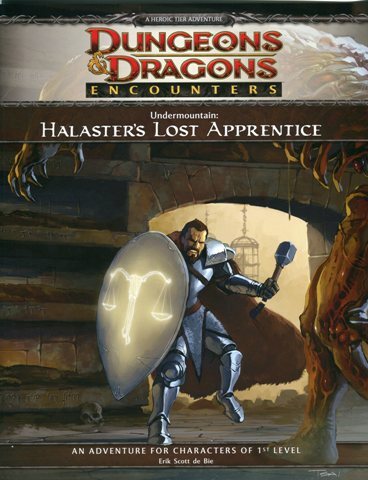 The adventure is set in the Forgotten Realms in a massive dungeon called Undermountain. The goal of the program is to get people to play D&D, particularly new players, and to promote the FLGS. I have really enjoyed the Encounters program as it gives me a chance to roll the dice on the other side of the screen. I have been playing Drax, a dragonborn paladin of Tempus. I play him as very over the top, not that bright (dump stat is Int), and compelled to challenge whoever he perceives as the toughest opponent, which he sees as his duty being a paladin of Tempus. Playing a defender in 4th Edition isn’t easy, especially at the early levels of the heroic tier. The term “meat shield” is an understatement, and one has to get used to doing less damage than in previous editions. This in particular can be tuff when you see some leather clad sissy roll all those sparkling dice. Being a defender is all about battlefield control and drawing fire. Drax is particularly good at this. The encounter doesn’t seem complete if he hasn’t made at least one death save. He has literally left bits and pieces of himself strewn throughout Undermountain. The group I have been playing with has been fairly consistent week to week; we have 2 other defenders (Warden and Fighter) and 2 strikers (Monk and Sorcerer). We typically struggle thru the encounters without a leader, especially if the strikers don’t roll well. I feel our tactics are generally good but there is either something in the encounter design or our DM (who is awesome) has been rolling better than average, as we tend to have our teeth kicked in with some frequency. It is hard to feel like you’re really defending comrades or controlling the battlefield when you are unconscious by the end of the first round, unless “controlling” means forcing the enemy to move around your limp body to get at your allies. I think it takes perseverance to play a defender in 4th edition as it takes several levels for your hit points to significantly outdistance the other roles and for you to get access to cool feats, powers, and magic items that will make you a more effective tank. One such task is to get your defences sorted out. Seriously, there is only a 3 point difference in AC between our monk who is wearing cloth and Drax who is in full plate and heavy shield. As a side note, nothing in Undermountain seems to attack AC, which is unfortunate as this is Drax’s highest defence. All in all though I love playing Drax, and am proud that he has made it to 2nd level. I can already see the change from first level, as he only got dropped once this week. So this is a shout out to all of you out there who choose to step into the breach and hold the line against the faceless hordes in your own games so some fancy pants monk or rogue can get all the glory. The session began with the party discussing Garrick’s classic mid-life crisis, as he decided to return to school and change careers and is know a monk, apparently the intervention around his anger management issues was a success. Also Kaz decided to go back to school to re-specialize to in order to provide more healing for the group. The party was also unhappy with the dwarven fighter Breunor after his weak showing and since it was still his probationary period decided to let him go with two weeks’ pay. They decide to fill the position with Rhogar, a dragonborn paladin. After laying some serious smack down on Bairwin and his fellow cultists, our hero’s decided to rest up at Mrs. Wrafton’s before setting off to the destroyed keep to take care of a guy named Kalarel and save the day. Valthurn was able to provide some valued history of the keeps origin, who Shadraxil is, and why it would be a major bummer if he was set free. During that evening Grimlock had a dream with a divine connection, as it appears that Tempus has taken an interest in his career. While Khaine had a far more disturbing vision. Once at the keep, the party made short work of the Goblin guard with each member recording kills. Grimlock did his best impression of the hulk and was killing people with his bare hands and then decided to fastball special Garrick up to a ledge so he could obliterate a foe. The session ended when the party clinically took apart the Goblin lieutenant Balgron the Fat and his minions. Garrick pulled of a move that defied logic as he weaved through the field and laid a beating on 5 different foes, and was then mortally wounded. Seeing his imminent fate, Balgron surrendered and has agreed to aid our heroes in exchange for his freedom. The party also picked up some loot: a shield for the paladin, a holy symbol for the cleric, a wand and leather armour for the warlock and a holy symbol of Tempus that when Grimlock grasped enchanted his spiked gauntlets. What will happen next? The session started off with our party acquiring a new member by the name of Breunor, a Dwarven fighter who is a cousin of Thair Coalstriker from Mithrill Hall, previously hired to help deal with the “Kobald issue”. The party decided to leave investigating Bairwin until after they had dealt with the Kobalds and collecting their fee. Shortly after the party set out they were waylaid by said “Kobald problem”. The party had their first taste of having magic hurled at them and did not seem to enjoy it. Breunor had some difficulty adjusting to the adventuring lifestyle and had Garrick questioning this recent addition and the prospect of splitting his cut with him. After dispatching the creatures the party discovered a holy symbol of Shar around the Wyrmpriest’s neck. A debate ensued on whether to return to town and rest or push on. It was decided that they should push on as it might be embarrassing having to return to town so shortly after leaving. The party tracked the Kobolds’ to their lair and after a hard pressed fight where both Breunor and Grimlock went down; they defeated all comers including the mighty Iron Tooth. After searching the lair the party discovered a note indicating the presence of a spy in Winterhaven and the cults’ mad plan to open a rift and free “Shadraxil”. They also had a name “Kalarel”. They also came across a crossbow that they had traded to Bairwin back in Winterhaven confirming their suspicions of the man. After returning triumphantly to Winterhaven and throwing the head of Iron Tooth at Lord Padraig’s feet, they collected their reward and much to Lord Padraig’s dismay extorted more money from him to deal with the cult. Khaine sought out the scholarly aid of Valthurn to learn more of cults devoted to Shar and the history of the destroyed keep, as well as any information of Teifling history. Garrick attempted to spy on Bairwin. After getting cold feet Garrick decided to return to the Inn and it was decided that they would directly confront Bairwin with the evidence from the Kobald Lair. After confronting Bairwin an epic battle commenced in his hidden temple dedicated to Shar with the party striking a mighty blow for the forces of good. The party awaits any information Valthurn can provide while they formulate their next move……..
Our heroes traveled different paths to the Gilded Harp in the wee hours of that chill autumn morning. Grimlock Stonefist (Bob) after arriving in town and reconnecting with Lord Bloodhawk was quickly recruiting into the Purple Dragons as an “off the books” agent. Kaz (Chris) became a full member in the Church of Torm and learned the nature of divine magic. Garrick Slightfoot (Paul) was sent on a job without all the information by his gang leader Grell, his friend Khaine (Lance) decided to join him as usual. At the Harp the party was greeted by Torm Blackmoore and were introduced to each other, but not before dispatching a group of hired thugs bent on murder. After a slow start of being stunned and smacked around, the party found its adventuring legs. Khaine recorded the first kill of the campaign by unleashing a blast of dark and crackling eldritch lightening reducing one of the thugs to a burnt husk. Kaz provided valued healing ignoring potential harm to himself to aid a companion. Grimlock did what meat shields do best, he stood toe to toe with multiple foes including the leader of the thugs soaking up damage and dishing it back. Garrick “sly flourished” here and “sly flourished” there, dealing more damage with a dagger than one thought was possible. After the battle, and after Garrick creeped out the others by ordering the surviving thugs to remove their clothes “to make sure they weren’t concealing weapons”, the party accepted the plea for help from Gervan, an acolyte of Chauntea, to root out and destroy a death cult of Shar that has taken hold in the town of Winterhaven. On the road a great debate ensued on potential names for this intrepid band of heroes without any resolution. On the road they were attacked by a group of Kobolds who fought to the death with no hint of surrender. Garrick learned the dangers of splitting the party and was the first of the campaign to have a near death experience. Luckily Kaz was there to provide some much needed healing. It was a true team effort with everyone dispatching at least one foe until Grimlock ended the fight with a devastating cleave that felled the final two adversaries at the same time. After arriving in Winterhaven and acquiring lodging, the party set out to investigate the whereabouts of this death cult. They questioned everyone they could find. There was Ninvaren an elven hunter who appeared to be hiding information about herself but asked many questions of her own; Thair Coalstriker the local smith who has fallen on hard times due to Bairn Winderkonson’s store’s rapid and surprising success; Bairn himself, the most recent transplant to Winterhaven seemed friendly and welcoming but slightly suspicious and showed an interest in Khaine and Garrick. The party decided some further investigation of Bairn was needed; Sister Linora shared her vision from Chauntea regarding the cult of Shar but their whereabouts are still unknown and the people of the town find it hard to believe that a cult is active in the town. Valthurn , a local sage provided some history of the area including the dragon burial site and the destroyed Keep. The party accepted a contract from Lord Padrig, the ruling noble to deal with the increasing Kobold activity, as this seemed to be the primary concern of the majority of the townsfolk.